Damian is an overcomer and an inspiration of hope to many. He is 14 year old gifted young man with a passion and joy for God & people and extensive history of complex medical conditions. 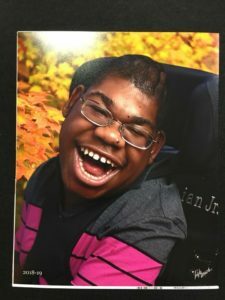 He experienced a global brain injury at birth, which has resulted in Developmental Delay, Cerebral Palsy, Seizure Disorder, Visual impairment, hearing loss and a host of other medical conditions. Despite the long list of diagnoses he continues to show the world that everyone must be given a chance to shine in this world.